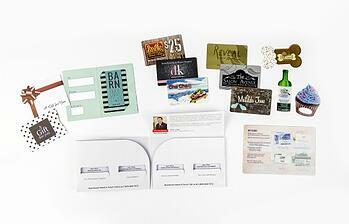 Request Samples of Custom Gift Cards from Plastic Printers, Inc. Looking to start a gift card program for your business? It's important to see, touch and feel the quality of our products for yourself. We work with businesses of all sizes to design customized gift cards that work with their existing register or Point of Sale (POS) system. Please let us know what types of custom gift cards you are most interested in receiving as a sample. We can either send them in the mail or provide virtual samples to you anytime upon request. If there are any special features you wish to see like embossing, clear or transparent cards, foil stamping, writable, scratch offs; please specify this in the notes. * By filling out the form on this page you are giving Plastic Printers permission to mail you samples, to contact you as neccessary with new information, promotions and offers.